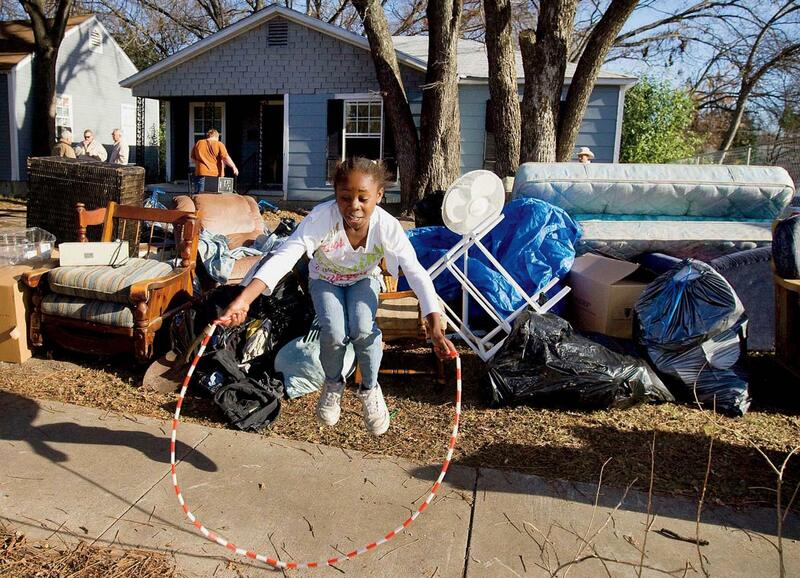 A young girl jumps rope on the sidewalk next to her family’s belongings after they received a court order of eviction that was carried out by McLennan County deputy constables in Waco, Texas. Families like hers are the kind of clients badly in need of legal representation—and most often unlikely to receive it. Almost a century ago, a young Boston lawyer named Reginald Heber Smith published a landmark book called Justice and the Poor. It was about how people struggling economically were faring in the American legal system and why American lawyers needed to provide them with free legal aid. He wrote, “Nothing rankles more in the human heart than the feeling of injustice.” At the time, there were only 41 legal-aid organizations in the country, with a total of about 60 lawyers. The Boston Legal Aid Society, founded in 1900, was one of them. As a student at Harvard Law School, Smith had spent his summers as a volunteer there. When he graduated in 1913, he became the leader of that four-lawyer office and instituted a “daily time sheet”—on which lawyers recorded the hours they spent on cases—as a tool for increasing efficiency in addressing the 2,000 or so cases the society had on behalf of clients. Smith’s vision has never been realized in the United States, but it haunts the debate about how best to serve the legal needs of poor and low-income Americans—and about whether we even know what works best to solve the problems of this group. Poverty’s effects on human health are well documented: lives tend to be sadder, harder, and shorter. But the effects on poor and low-income people’s lives of needing a lawyer and not having one are not well documented at all. The main divisions in the debate today are about resources: between those who want to see Smith’s vision realized, with lawyers central to the story, and others who are convinced it’s not possible to provide enough lawyers to meet the need—and who also believe that, in many instances, a lawyer isn’t needed to solve the problem; and between those who think it’s essential for the federal government to fund legal aid (with many convinced the government should provide much more money than it now does) and others, like officials in the Trump White House, who say the federal government should have no role in paying for legal aid. The leaders in this debate are far-flung and from diverse backgrounds and institutions. But Harvard Law School (HLS) and people with Harvard ties appear prominently in this story, beginning with Smith himself. In 1976, the first president of the country’s main funder of civil legal aid, the Legal Services Corporation, was Thomas Ehrlich ’56, LL.B. ’59. The corporation’s current board chair, who is leading the fight to maintain funding for it, is John G. Levi, J.D. ’72, LL.M. ’73. The vice-chair is Martha Minow, the former dean of the law school, who broadened and deepened the school’s commitment to public-interest lawyering more than any leader in the school’s history and is one of the country’s most influential advocates for civil legal services. Initiatives under way at HLS have returned it to a prominent role in advancing legal aid—and in developing new approaches that will change and enhance the delivery of these services in the future. Daniel Nagin, vice dean for experiential and clinical education and faculty director of both the school’s Legal Services Center and its Veterans Legal Clinic, is exploring improvements in legal services that could help bridge the divide between those who insist that lawyers are essential in providing legal services and those who believe they aren’t. Green professor of public law D. James Greiner, faculty director of the Access to Justice Lab, is HLS’s main proponent of the view that sometimes the solutions can be simpler and less expensive. The work of all three, and of many others at the law school, is important to anyone who knows about America’s enormous unmet needs for legal services. Early this year, almost 20 percent of Americans lived in families with household income low enough to make them eligible for legal aid paid for by the federal government. The threshold is at or below 125 percent of the federal poverty level ($30,750 for a family of four this year). Of these 60 million or so people, around seven out of 10—more than 40 million—were in households that had faced a civil legal problem the previous year. Most said the problem “severely” or “very much” upset their lives: they lost disability benefits, for example, and could no longer afford essential medical care; they were arrested on a drug charge and the state put their children in foster care; or they fell behind on rent and were evicted. The 2017 report concluded that this “gap” in fact “has stretched into a gulf.” In the 15 states plus the District of Columbia where the percentage of the population eligible for legal aid exceeded 20 percent, the gap was worse: from Mississippi, with 28 percent eligible, to the District of Columbia, Florida, and Texas, with 21 percent eligible. All those states, except for New Mexico, went for Donald J. Trump in the 2016 presidential election. (The District also favored Hillary Clinton.) Especially in these states that went for Trump, there is vast need for legal aid. Lack of education appears to be a crucial factor in creating this need: almost nine out of 10 of their low-income adults have no college degree; six out of 10 have no more than a high-school education. Of those who qualify for civil legal services, 44 percent are white. Trump’s margin among white voters without a college degree was the widest in any presidential election since 1980. In effect, whites without college degrees who qualify for and need legal aid elected him. The number who qualify for such aid is likely 50 percent greater than the “Justice Gap” report described; based on U.S. Census Bureau data for all of 2015 (the most recent available), an additional 32 million people had incomes at or below 125 percent of the federal poverty level for any two-month period that year—making a total of almost three out of every 10 Americans. The Legal Services Corporation (LSC), a not-for-profit organization funded by the federal government, remains the single largest funder of civil legal aid in the United States. In the 2017 fiscal year, beginning in October 2016, it spent $360 million on grants and other services. That was about two of every five dollars spent by the 133 organizations receiving grants (they are mostly not-for-profits serving all or part of a state), and likely two out of every eight dollars spent in total on legal services in the United States. James J. Sandman, the president of the corporation, describes it as the backbone of America’s system for delivering civil legal services. “Our goal,” he says, “is to be sure that people everywhere have some access to these services.” At Pine Tree Legal Assistance, in Maine, services range from providing simple legal advice, say, about a veteran’s benefits, to full representation in larger cases. More than half the matters it handled in 2016 involved housing—helping tenants avoid evictions and home-owners avoid foreclosures on their mortgages helped saved the state $2.6 million in the cost of housing them in emergency shelters. At four organizations in Massachusetts, services cover a similar range. Last year about half dealt with housing troubles as well, and about one-fifth with family matters like securing guardianship of orphaned and abused children and helping survivors get protective orders against abusers. Those and other services saved the state $16 million in medical and other costs. At seven organizations in Florida, seven out of 10 matters dealt with family and housing troubles. About two out of 10 dealt with money problems—lost jobs, lost benefits, lost credit, and lost nest eggs. Legal services saved the state $60.4 million in avoided costs for foreclosures, emergency shelters, and more. In every state and Washington, D.C., providers of legal services helped low-income individuals and families meet their basic human needs: housing, food, income, safety, education, and well-being. To put LSC in context, its grantmaking in 2014 would have ranked it among the top 20 American foundations. But its total revenue in 2015 would have ranked it only 100th among law firms around the world. The LSC budget request for fiscal year 2018, which is $527.8 million, also details the amount of money each state, plus the District of Columbia, would have to make up in current funding for civil legal services if LSC no longer provided grants: almost nine-tenths of total funding for legal aid in Alabama and Vermont, eight-tenths in Connecticut and South Dakota, and between half and three-quarters in 19 other states. These entities would almost certainly be unable to make up the difference. LSC is unlikely to be eliminated, but it will likely receive much less funding in fiscal year 2018 than it seeks. LSC is being funded at its current level through the beginning of December 2017 under the three-month spending law that Congress and the president approved in September. When Congress decides on the budget for the rest of the fiscal year, the Senate Appropriations Committee has recommended funding at the current level. The House Appropriations Committee has recommended about one-sixth less than the fiscal 2017 budget of $385 million (including funding for management and oversight). Letters from state chief justices and court administrators, state attorneys general, law-school deans, and corporate general counsels, as well as from members of the House and the Senate, underscored what one letter called “united, bipartisan opposition to the Trump Administration’s proposal to eliminate all federal funding for the Legal Services Corporation” and substantial support for it. The bipartisan support in the letters reflects bipartisan backing. From 2011 to 2015, as Congress became increasingly polarized, the number of members voting in favor of LSC funding increased by about one-third, especially among Republicans. Members of both parties understand that, among other things, the corporation provides a valuable form of constituent service. Yet both the House and the Senate recommendations maintain dozens of restrictions on how LSC can spend its money. Legal-aid organizations receiving LSC grants can’t take part in class-action lawsuits; they can’t get involved in litigation or other activities about immigration, abortion, assisted suicide, desegregation of public schools, or civil rights of prisoners, LSC itself, or (with narrow caveats) criminal cases. They can’t engage in legislative or regulatory lobbying, political activities like voter registration and promoting ballot measures like referendums, or welfare reform. They can’t engage in or encourage public demonstrations, picketing, boycotts, or strikes. The restrictions are meant to keep legal-aid organizations focused on solving legal problems for individuals. More to the point, they are meant to keep them from engaging in collective action to reform laws and public policies, from representing large groups of people in lawsuits challenging government agencies or major corporations, and from taking sides in disputes about the most divisive social issues. They are intended to safeguard the status quo. A further restriction is that LSC must follow a formula when making grants: each state receives its share of funding based on its share of the American population in households with income at or below 125 percent of the federal poverty line for households of that size, from one person ($15,075) to eight ($51,650), with each additional member allowed a modicum of extra income ($5,225). In fiscal year 2015, 93 percent of LSC’s total spending was on formula-based grants to legal-services organizations everywhere, with the most ($43 million) going to California and the least ($0.5 million) to Vermont. The bipartisan backing in Congress is a product of all of these restrictions, which reflect a history filled with controversy. A national Legal Services Program was part of the Office of Economic Opportunity during President Lyndon Johnson’s War on Poverty in the mid 1960s. Although only a small fraction of the initial funds went to legal services, the new program greatly increased the country’s support of legal aid for the poor. Those lawyers provided legal aid to the poor while seeking to reform law that penalized people for being poor. During the almost century that some form of legal aid had existed in the United States before the Legal Services Program, the Supreme Court heard one case brought by a legal-aid lawyer. Between 1965 and 1974, legal-services lawyers became the voice of the poor at the Court. It accepted 64 percent of the cases the lawyers asked them to, a remarkably high rate. Of the 110 cases considered, those lawyers won 62 percent, with conservative justices supporting those victories as fully as the liberals. Legal-services lawyers developed a new field of poverty law while obtaining justice. The hostilities led, in 1974, to the creation of the Legal Services Corporation as an independent organization funded largely by the federal government, with the purpose of providing poor people with access to justice as a means of solving problems—but no longer with the aim of alleviating, or even eliminating, poverty. In the final year of Jimmy Carter’s presidency, the LSC budget reached its high point, allowing it to support 325 grantees, with 1,450 offices and 6,200 lawyers. But in 1981, President Reagan brought his antipathy to CRLA and to legal services with him to the White House. His team submitted a zero-budget request to Congress for legal services. LSC, as an independent agency, submitted its own request for an increased budget. With some political wrangling, the organization ended up with “only” a 25 percent cut in funding. The contrast between the ardor of the Carter administration and the antipathy of the Reagan administration established the pattern for Democrats and Republicans that has continued since. Making matters worse, by the end of the second Bush administration, in 2009, LSC’s luster was tarnished by a series of scandals involving embezzlement, fraud, misuse of money, and shoddy financial controls of grantees. There were also lesser ignominies involving sloppy financial controls and lavish spending on travel and entertainment by LSC executives. Some of the bad news reflected political spin by LSC’s critics. Politics was reducing it to a bureaucracy where squabbling about real and alleged misdeeds distracted from the mission. The founders had immense blind spots about the scope of equality as an element of justice: they authorized slavery in the Constitution and approved the exclusion of women from political, economic, and social power. But they identified “liberty and justice for all” as an essential aspiration. In a rule-of-law country that revolted against the rule of an autocratic king, they put their faith in a system prizing a government of laws, in which Lady Justice wears a blindfold to represent her impartiality. John Levi is a partner in the Chicago office of the law firm of Sidley Austin. He hired an HLS student named Barack Obama as a summer associate in 1989 and asked Michelle Robinson, an HLS grad who was a first-year associate and enthusiastic about the firm, to be Obama’s summer adviser. They got married in 1992. Levi has been a cheerleader for both in their careers, and raised money for the former president’s campaigns. When the Obama presidential transition team asked Levi if he wanted to join the administration, he said he planned to stay in Chicago but would be interested in a substantive part-time role. (He told them he wasn’t interested in “fluff.”) Chairing LSC has elevated him from prominent Chicagoan, carrying on a family tradition of community service, to influential national leader among lawyers. LSC under Levi has embraced traits taken for granted during the Obama administration: pride in delivering good government; belief in the importance of bipartisanship in policymaking; and insistence on the highest possible standards in public service. Levi was eager to have Martha Minow as vice chair of the board because of her long involvement with legal services for the poor and the prominence she gave public-interest law both in the HLS curriculum and in what she championed as a career for its graduates when she became dean in 2009. (Bromley professor of law John F. Manning succeeded her in July; she is now Carter professor of general jurisprudence.) They will remain board members until their successors are picked by the Trump administration and confirmed by the Senate, after their current three-year terms end this December. In 2011, they chose Jim Sandman as president. After spending 30 years at the law firm of Arnold & Porter, in Washington, D.C., where he was managing partner for a decade, he became general counsel and chief legal officer of D.C. Public Schools from 2007 to 2011. He was also a past president of the D.C. bar and a past board member of D.C.’s Neighborhood Legal Services program, which LSC supports. Under the leadership of these three, the hundred or so employees of LSC have functioned like grant-makers at a tautly run foundation. They have imposed fiscal discipline on themselves and the organizations they fund, and promoted high performance. They have worked closely with the ABA and other groups to increase the amount of legal-services time that lawyers provide low-income Americans without charge (pro bono) or at low rates (low bono). They have persuaded Congress, foundations, and corporations to support experiments in the use of technology so there will be a baseline of support everywhere in the country for people who can’t afford a lawyer—including in rural areas, which are especially hard to serve. Levi considers the justice gap a crisis on the scale of a public-health epidemic and has worked to make eliminating it a national priority, among lawyers but also among leaders outside the legal world. He persuaded the American Academy of Arts & Sciences, of which he is a member, to undertake a project to define the scope of the justice gap and educate American leaders about the extent and the consequences of it. He has also enlisted celebrities to join LSC’s Leaders Council as advocates for legal services: Henry Aaron, the great home-run hitter, John Grisham, the best-selling author of legal thrillers, and others in business, finance, and other fields. But the justice gap remains a gulf, and LSC is notably constrained in how, and how much, it can address the problem. During the past decade, the average number of eligible households with at least one civil legal problem was about 9.5 million annually. The average number of households served by LSC-supported legal-aid programs during that period was 815,000: about one-twelfth of the need. In 2015, about 9,000 people worked on legal-service problems at LSC grantees—about 4,600 of them lawyers. Assuming those lawyers represent between half and three-fifths of the lawyers in the country providing legal aid full-time, the total today is likely well under 1 percent of America’s 1.2 million or so lawyers. With average salaries of about $50,000 a year, they are the lowest-paid group of lawyers in the country. In the World Justice Project’s 2016 Rule-of-Law Index, the U.S. ranked ninety-fourth of 113 countries in “accessibility and affordability of civil justice.” “Liberty and justice for all” remains far from a reality. Former HLS dean Martha Minow was among the minority of deans whose mark on their law schools strongly reflected their scholarly interests. From the start of her career as a professor in 1981, she showed a passion for exposing inequities embedded in American law and for helping create a more egalitarian society. As vice chair of the Legal Services Corporation, she has pushed for what’s possible from the government and the legal profession. As dean, she pushed for what neither of those institutions has done—for imagining and creating what is necessary to address the justice gap. She helped spark much of the school’s scholarship and innovation that hold the promise of reshaping legal practice and broadening access to legal services. About 80 percent of recent HLS graduates have “taken a clinic,” in law-school vocabulary—just as they took traditional academic courses and received credit for them. The school now offers three dozen choices for experiential learning. They begin with the Harvard Legal Aid Bureau (HLAB), the oldest student-run legal-services office in the United States, where students earn credit for doing law-reform activities like litigation that can change public policy, or for representing low-income clients in housing, family law, and other civil legal issues, and extend to the WilmerHale Legal Services Center, which houses five distinct clinics and remains the largest of the school’s legal-services providers. HLAB involves a two-year commitment for 2Ls and 3Ls of at least 20 hours a week during term-time, and often 40 or even 60 hours, on top of other academic requirements. Current students in the bureau choose 25 new students each year, in an onerous process designed to deter any dabblers. They favor applicants whose experiences are likely to help them empathize with clients. Many students accepted are the first in their families to go to college or law school. Most are people of color. Seeing themselves as gatekeepers, since the HLAB receives far more pleas for legal aid than it can handle, they feel a duty to use their time and talent on behalf of clients who are especially needy even if the need is different from those the bureau has traditionally tried to meet. A major premise of the Legal Services Center is that the United States is not going to solve the problem of scarce access to justice by providing a lawyer for everyone who needs, yet can’t afford to pay for, counsel. Instead, the Harvard center pursues what Stanford law professor Deborah Rhode terms “adequate access to justice”: this includes, she wrote, “increased simplification of the law; more self-help initiatives; better protection of unrepresented parties; greater access to non-lawyer providers; and expanded opportunities for informal dispute resolution in accessible out-of-court settings”—in other words, different levels of intervention, depending on need and circumstance. The most powerful simplification of the law today comes from technology. William Palin, whom Nagin described as a one-of-a-kind, out-of-this-world software developer, is HLS’s first Access to Justice/Technology Fellow. A graduate of Boston’s Suffolk Law School, he taught himself how to write code using books from the Cambridge public library, where he had set up a one-man practice in family law. In 2014, he won a contest co-sponsored by Suffolk and the ABA with an app he developed called PaperHealth. It lets people in Massachusetts quickly fill out, sign, and save living wills (“If my heart stops, I do not want it to be restarted”) and health-care proxies (“a simple legal document that allows you to choose someone to make medical decisions for you”) and then emails them to designated hospitals and health-care providers. In the next two years, he transformed himself into a software developer and started at HLS. He works within the school’s clinics, hanging around with teachers and students to learn what they do and how they do it and thinking about whether he can develop a piece of software or an app that simplifies and speeds up their work—in his words, “helps them become better lawyers.” He helped Jeffrey Roderick, J.D. ’17, develop software that saves five or six hours a case by automating what happens when a clinic accepts a client and gathers basic information about the matter. On the website of Developing Justice, Palin’s HLS program, there’s a link to the Guardian Service Project, a tool he developed to help people who want to file for guardianship of an adult who has “a clinically diagnosed medical condition” and is “unable to make or communicate effective decisions about their everyday self-care, health, and safety.” The project emerges from another premise of the Legal Services Center: that matching the client with a lawyer is not always necessary. According to Jim Greiner, head of the Access to Justice Lab, sometimes people need a lawyer in the fullest sense. Sometimes they need a lawyer for a one-time representation. Sometimes they would be better served by a limited legal technician (permitted in Washington state), who is trained and licensed to help people going through a divorce, a child-custody battle, and other family-law matters—just as a nurse practitioner can treat some patients and prescribe medication. Sometimes people can help themselves. “Ignorance, basically, about the value of evidence-based research,” Greiner says. He thinks very few in the American bar or on the bench believe in rigorous evaluation of civil legal services or court techniques—but “just because we have been doing something one way for a long time doesn’t mean it’s the best way to address any particular problem.” The premise of the Access to Justice Lab is that the way to figure out what works is to do it and test it. In Massachusetts Housing Court, for example, Greiner and colleagues “randomized” the potential clients who received offers of traditional attorney-client relationships from legal-aid staff attorneys and those who got only the limited service of a lawyer for a day. In examining whether matters not yet in litigation eventually reached court, whether tenants remained in possession of their housing, and other issues, they found “no statistically significant evidence” that full versus limited representation made a big difference in any of the outcomes. Greiner is also convinced that the access-to-justice problem doesn’t merely burden poor and low-income Americans, because only a small fraction of Americans can afford the justice they need. That’s a problem of the legal market for all but wealthy individuals and organizations. There is wide agreement that the current eligibility threshold for federally subsidized legal aid (125 percent of the federal poverty level) is far too low. Many programs funded by sources other than the LSC provide services to people with incomes up to 200 percent or even 400 percent of that level, because many of those households are financially precarious. That makes the justice gap even wider. It makes Congress’s and the country’s longstanding indifference to the gap even more profound. John Levi has set a goal for the United States of closing that gap completely by 2026, when the country will be 250 years old. However the gap is defined, it’s very unlikely the country will close it by then. But his other goal is to shift the gap from a concern only of lawyers into a concern too critical to be left to lawyers alone: they haven’t solved the problem, and they have had a century to try. If he succeeds in transforming it from a legal problem into a moral and a political one, he will do as much as anyone ever has to help close the gap. Contributing editor and legal journalist Lincoln Caplan ’72, J.D. ’76, who is a senior research scholar at Yale Law School, profiled Supreme Court Justice Stephen Breyer  in the March-April issue. In 2014, Earl Johnson Jr. published a comprehensive three-volume work, To Establish Justice for All, about the history of civil legal aid in the United States, from which some of the history in this article is distilled. The project of the American Academy of Arts & Sciences to define the scope of the justice gap and educate American leaders about the extent and the consequences of the gap includes a special issue of the Academy’s journal Daedalus, which Caplan is working on as a guest co-editor.